My dining companion and I were at Millenia Walk over the weekend when we chanced upon a signboard which reads "eggs until 4pm daily". Prominently displayed outside Patisserie G, opened by Gwen Lim, and known for its desserts. There was an available table or two, so we decided to step in. Lots of wood could be seen – from the tables and chairs (was that Atomi's Hiroshima by Maruni?) to counters, shelves and flooring. 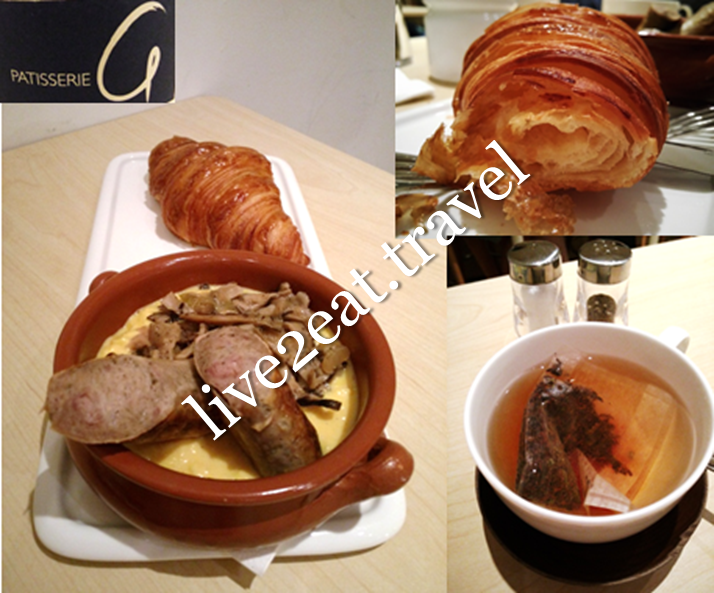 Ordered scrambled eggs en cocotte with pork sausage, mushrooms and chose butter croissant over toasted brioche. Could neither rave about the three creamy scrambled freedom range eggs nor fault the sausage. While the sautéed mushrooms were lovely, it paled in comparison to the croissant. Its buttery crust was so crispy and flaky with a soft, airy and fluffy inside that I could eat it on its own. And not stop until it was gone.